Place the chopped sweet potatoes on a large baking sheet. Drizzle with olive oil and toss. Season with salt and black pepper, to taste. Place sheet in the oven and roast for 20 minutes. Using a spatula, toss the sweet potatoes. Roast for an additional 15 minutes or until the sweet potatoes are tender. Place chopped lettuce in a large bowl. 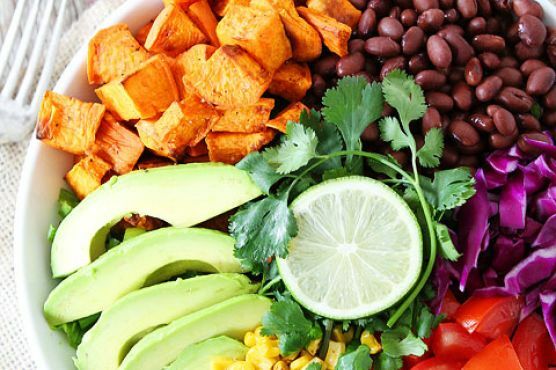 Top lettuce with roasted sweet potatoes, black beans, tomatoes, corn, avocado, purple cabbage, cilantro, and green onion. Squeeze fresh lime juice over the salad. Serve with salsa, pico de gallo or Creamy Avocado Dressing, if desired.Note-I like to roast or grill the corn for the salad. This salad is very flexible. Feel free to add your favorite Mexican toppings to the mix. Don't use the avocado dressing if you need the salad to be vegan.